When you're asked to become a mentor to someone, it can be one of the most rewarding experiences of your life. You've reached a stage in your career wherein you have valuable knowledge to pass on, and you can impart that wisdom to an eager disciple. However, the difference between being a good mentor, and one of the best, is all about how much effort you put in, and the ground rules you set for both yourself, and the student. Here's some advice to get you there. We learn by failing. You shouldn't be afraid to let your disciple fail. Of course, they should be at least ready to attempt the task at hand, whether it's learning a new skill, or leading a team project. But success will not come instantly, and by letting them learn from their mistakes (and embracing every success along the way) you'll prepare them way better than a mentor who shelters them from every possible struggle. Mentoring is not a one-way street. Whether you're 28 or 88, there's always something new to learn. Sure, you know a lot; enough to be a mentor, but your mentee brings new experiences and information to the table as well. Mentoring, when done correctly, is a commitment to teach what you've learned to an eager mind. The problem with minds is that they don't easily switch off. Your protégé will have questions, thoughts, and maybe even big ideas outside of the usual 9-5 work day. A good mentor will be available during the work week. A great mentor will be available when he or she is needed, regardless of the time. It's fine to set boundaries, of course ("I'm at a wedding, save your questions until later"), but to simply shut them down when the clock turns to 5:01 p.m. is not going to help them reach their full potential. 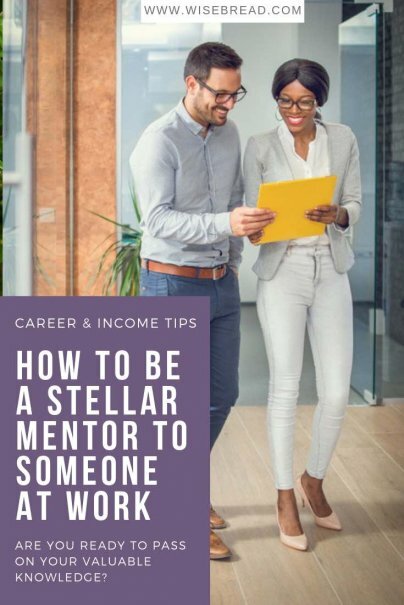 When you become a mentor, you should be prepared to interview your mentee at the start of the process and figure out what they want to get from you, and the relationship. It can be a casual conversation at a coffee shop, but take notes and set at least five or six definitive goals for both of you. Make sure these are goals that will prove your mentoring has not only succeeded, but has done so in necessary and specific areas. For example, say you're mentoring someone to become a better swimmer. The goals could be "learn the backstroke," "complete a flip-and-turn successfully," and so on. This applies to any industry or pastime, and as someone with a great deal of experience, you shouldn't have trouble setting specific goals. For some mentors, the path to success is paved with shouting, reproach, humiliation, and blame. You'll often find this kind of behavior on reality shows, because they need the ratings, but that is not the norm. You will not be a great mentor if you point out every single mistake, jump on every failure, and scream your way to achievements. Yes, it will sometimes be necessary to talk about a major misstep, but you need to focus on the successes and heap praise upon the victories. Mentees will get much further when you show them how proud you are of their accomplishments, rather than how much you hate their mistakes. When I was a junior copywriter, I had some incredible mentors. One of them, a creative director, saw my potential and advised me to leave the company and work for one that would challenge me more. Needless to say, I took that advice. He was loyal to me, not the agency, and I have never forgotten his guidance. Invest your time in the person, not the position. What are they bringing to the table? Are they going to be miserable here? Are they meant for another career entirely? As a mentor, when you see this in your mentee, it's your duty to point it out. Most of the time, it comes back to reward you.